Est. delivery dateEst. delivery Fri, Apr 26Colour: CreamWidth: 60"
GORGEOUS PARIS POODLE EFFEL TOWER COTTON FABRIC - PARIS BEBE THE LOFT COLLECTION. Perfect for shabby chic style quilting,dresses,curtains, patchwork, cushions. and more. 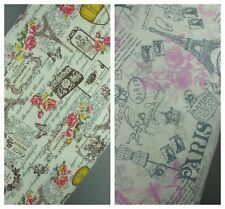 Eiffel Tower Paris/France 100% Cotton Poplin Printed Fabric. Eiffel Tower. Robert Kaufman. Quilting Fabric. Fat Quarter. If you buy Two Fat Quarters. If you buy Four Fat Quarters. 100% Craft Cotton. Travel Laundry Bags, Linen Bags. Eiffel Tower Natural LINEN - Cotton Fabric. Eiffel Tower natural LINEN Cotton fabric. 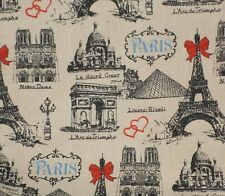 Cotton Linen Blend Craft Fabric - Paris Eiffel Tower Panel Fabric. Background is NOT white, close to light beige colour. The listed price is for1 piece in total (about 110cm x 37cm), includes 3 panels, each panel about 33cm x 23cm. Designed by Suzy Ultman for Robert Kaufman. Est. delivery dateEst. delivery Fri, Apr 26Width: 60"
The fabric is 45" wide, which is the standard width for these fabrics. Colour available is as shown. We have other fabrics available from this range and others. 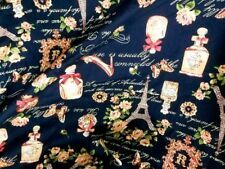 Eiffel Tower range of printed fabrics by. 15cm tall by 8cm wide. They are suitable for all craft projects including quilting, dressmaking, shirts, blouses, skirts, cushions and patchwork. This is a Fat Quarter of printed, 100% cotton Fabric from the. Temptations range by. 2.5cm x 1.5cm. They are suitable for all craft projects including quilting, dressmaking, shirts, blouses, skirts, cushions and patchwork. This is for a Fat Quarter of printed, 100% cotton Fabric from the. A lovely linen remnant. Great for cushion crafting etc. Approx size: 50x150cm. Suitable for DIY Table cloth, Cushion, Throw Pillow, bags…. We will respond to you as soon as possible and try our best to solve any problem in a friendly way.